• White flour is the finely ground endosperm of the wheat kernel. 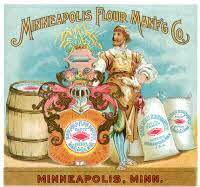 • All-purpose flour is white flour milled from hard wheats or a blend of hard and soft wheats. It gives the best results for many kinds of products, including some yeast breads, quick breads, cakes, cookies, pastries and noodles. All-purpose flour is usually enriched and may be bleached or unbleached. Bleaching will not affect nutrient value. Different brands will vary in performance. Protein varies from 8 to 11 percent. • Bread flour is white flour that is a blend of hard, high-protein wheats and has greater gluten strength and protein content than all-purpose flour. Unbleached and in some cases conditioned with ascorbic acid, bread flour is milled primarily for commercial bakers, but is available at most grocery stores. Protein varies from 12 to 14 percent. • Cake flour is fine-textured, silky flour milled from soft wheats with low protein content. It is used to make cakes, cookies, crackers, quick breads and some types of pastry. Cake flour has a greater percentage of starch and less protein, which keeps cakes and pastries tender and delicate. Protein varies from 7 to 9 percent. • Self-rising flour, also referred to as phosphated flour, is a convenience product made be adding salt and leavening to all-purpose flour. It is commonly used in biscuits and quick breads, but is not recommended for yeast breads. One cup of self-rising flour contains 1-1/2 teaspoons baking powder and 1/2 teaspoon salt. Self-rising can be substituted for all-purpose flour by reducing salt and baking powder according to these proportions. • Pastry flour has properties intermediate between those of all-purpose and cake flours. It is usually milled from soft wheat for pastry-making, but can be used for cookies, cakes, crackers and similar products. It differs from hard wheat flour in that it has a finer texture and lighter consistency. Protein varies from 8 to 9 percent. • Semolina is the coarsely ground endosperm of durum, a hard spring wheat with a high-gluten content and golden color. It is hard, granular and resembles sugar. Semolina is usually enriched and is used to make couscous and pasta products such as spaghetti, vermicelli, macaroni and lasagna noodles. Except for some specialty products, breads are seldom made with semolina. • Durum flour is finely ground semolina. It is usually enriched and used to make noodles. • Whole wheat, stone-ground and graham flour can be used interchangeably; nutrient values differ minimally. Either grinding the whole-wheat kernel or recombining the white flour, germ and bran that have been separated during milling produces them. Their only differences may be in coarseness and protein content. Insoluble fiber content is higher than in white flours. • Gluten flour is usually milled from spring wheat and has a high protein (40-45 percent), low-starch content. It is used primarily for diabetic breads, or mixed with other non-wheat or low-protein wheat flours to produce a stronger dough structure. Gluten flour improves baking quality and produces high-protein gluten bread. • Any recipe calling for all-purpose flour may use ½ whole-wheat flour and ½ all-purpose flour. • If wanting the product to be 100% whole wheat, substitute 1-cup whole-wheat flour minus 1-tablespoon for every cup of all-purpose or bread flour. • To create a lighter whole-wheat loaf, add 1-tablespoon gluten flour and 1-tablespoon liquid for each cup of whole-wheat flour.